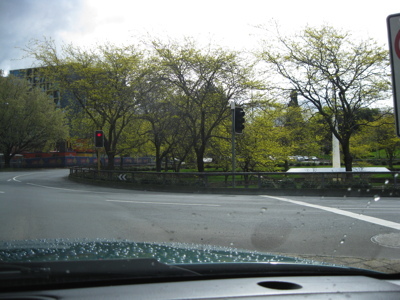 The photo at right is of the “Railway Roundabout” in Hobart (it maintains the name despite the fact that no train has viewed it for 30 years or more). This marked the point in the day when I had escaped the office — with far too many tasks undone — in order to ensure that I made it to the other end of the state in time to catch the ferry to Melbourne. The reason I am heading to Melbourne is to deliver my old car to its new owner (hence the need for the ferry rather than the more typical flight) and attend the 50th anniversary of my old Scout group, and catch up with some people and do a whole pile of work-related stuff. But all of that is for AFTER today. In the meantime here is today itself, and, since it is the 12th, it is told in the now-traditional collection of 12 photos. I used to be able to spout directions around the CBD like ‘from the railway roundabout go up Liverpool St past Websters and turn left at the Green Gate corner. Another left at the SBT corner, continue past Fitzies …’ I think this proves a) I’m old and b)my brain retains useless information from years ago but not what happened last Tuesday! That’s like the instructions “Continue past where the service station used to be … “. Actually Melbourne Uni has a few classic examples of this, with buildings called “Old Arts” and “Old Physics”, which is no help at all when trying to find current physics or being able to guess that the Melbourne Institute for Indigenous Development is housed in Old Physics. Well I’ve only lived in Tasmania 10 years, but these names still persist so I knew most of the landmarks Linda named!